The shelfie (aka a pic of styled shelves). Just like selfies, I’m never really satisfied. I’m constantly changing and rearranging like a maniac. It’s sort of ironic since the built-ins in the family room were one of the features that sold me on the house…little did I know they it would be a serious challenge to style!? 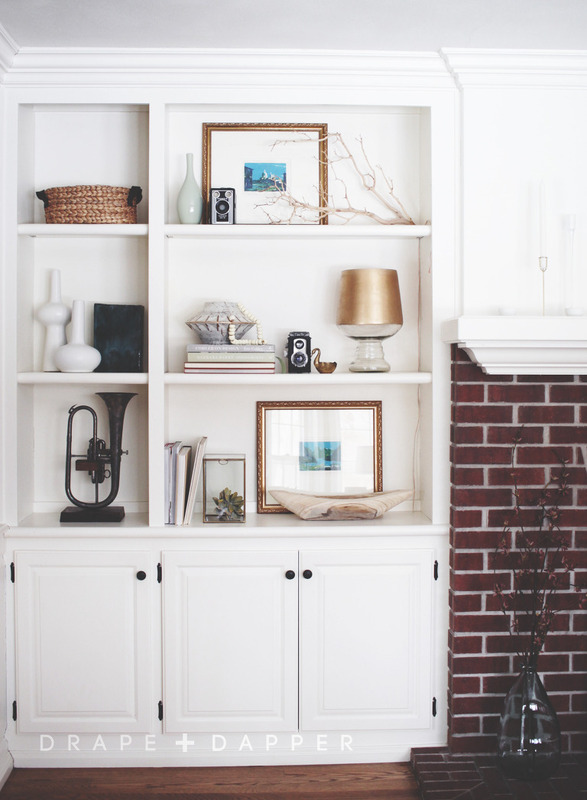 These shelves are a focal point of the room and flank the fireplace (which is still the original reddish brick color). *Side note: I’ve been so tempted to paint the brick but it’s the one thing the hubs has been really persistent about keeping original. What can I say, the 80’s is his favorite era and I need to pick my battles. I think there is enough white going on that having the original brick works okay here but it can be tricky. Needless to say, balancing the bold fireplace while keeping the rest if the look simple has been a bit of a struggle. I think after five years and countless cringe-worthy looks, I’ve finally figured out a few of the key ingredients. 1. 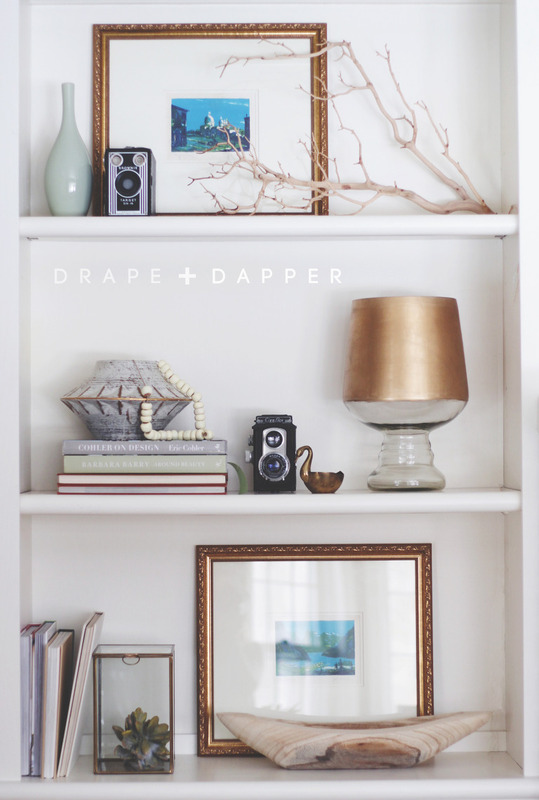 If you have adjustable shelves, reduce the number of shelves to keep the look more open. When we moved in there were 5 shelves on each built in and I removed a few so there were 3 shelves total. 2. Collect everything you want to use and have it all sitting out when you start (pluck from all over the house). 3. Less is more – don’t be afraid of white space. Sometimes keeping objects away from the sides of the shelves or centering one object on narrow shelves helps. 5. If the color of the book spine is distracting, turn it around. 6. Stick to a color scheme – I added touches of blues and greens since that is a theme in the rest of the room. Mix metallics. 7. Add natural textures like baskets, branches, wooden bowls. Don’t forget greens – faux succulents are fab. 8. Layer picture frames in, either leaning or on top of boxes or books. 9. If you have a fireplace in the center like mine, keep the decor simple. I love the look of a round mirror, or some layered artwork leaning and filler items like vases with greens/branches and candle sticks. 10. Invest in a few statement pieces and also include items you have collected on travels or vintage pieces. For the rest, don’t stress and just buy inexpensive ‘filler’ things. Home Goods, Hobby Lobby, Gordmans, Target and World Market are great for that! 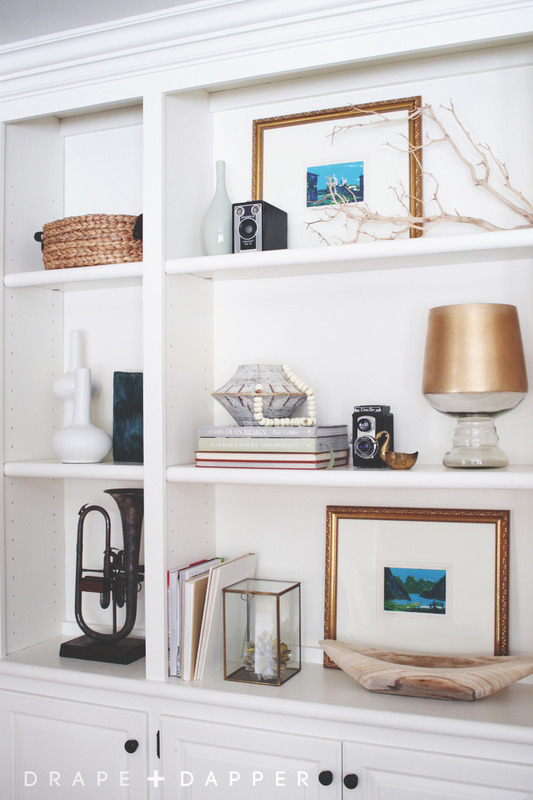 These tips will work for any sort of shelving, open, stand alone, built-ins, etc. glass box – hobby lobby /// faux succulent – memorial florists /// wood bowl – target /// beads – pottery barn /// branch – home goods /// all other items vintage. Vase 14″ – World Market /// faux branches (old) – Branching out & Co – they have a great selection! Faceted gold vases – Gordmans /// boxes and frame – pottery barn /// wood sphere – Gordmans // Faux succulents – Memorial Florsits (local) /// All other items old or vintage. Here’s a little action from 2012 . 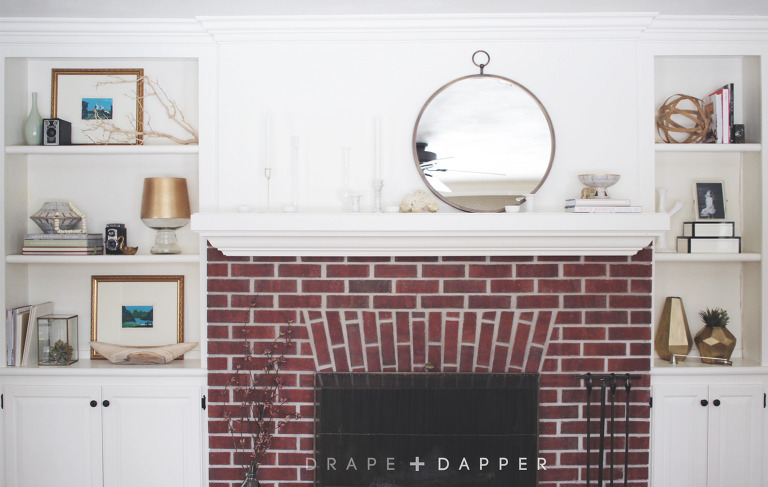 When we first moved in, I added wall paper to the back of the shelves and while I love that look, It was just way too busy with the brick fireplace (yikes). It took me about 3 years to come to that realization and once I returned them to the original white, things felt less fussy. I’ve since updated the furniture and decor to be lighter tones so that has helped neutralize the space as well.